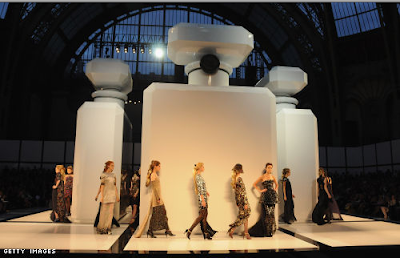 Perfume reaches new heights: does this constitute a lifetime's supply of No. 5, KL? Is it me, or do perfume bottles keep getting bigger? It's as if, in this age of economic agony, perfume manufacturers are attempting to make up for an essentially invisible product by turning it into a visible accessory. The message seems to be: "Why Carry A Purse When You Can Smell Good And Look Like It Too!" As the perfume market has become glutted with re-releases, sequels, and celebrity scents, costs have risen, but quality has decreased - only storied brands like Hermes and Chanel still use all natural ingredients and their own private flower fields. And in an economy where everyone is cinching their belts, it's hard to justify spending large sums of money on something nobody can see. Why not a beautiful, useful purse instead? Or shoes? Or a dress? So perfume manufacturers would like you to know: these bottles do more than collect dust on a dresser. Here's an idea: the bottle as furniture. Not too cozy for sitting, but it's the new IT status decor ("Have you seen Angie's new perfume statue? It's HUGE!"). How would you apply this each a.m.? With a crystal ladle? The smaller travel size. Try THIS at the airport sometime ("Ma'am, that is not 4.2 ounces."). Perfume for lonely hearts. It looks like a giant valentine, and it's huggable too! SJP wants you to covet this bottle, apparently - that's why she's showing it around like a Judith Leiber clutch. It doesn't look like it could hold your wallet and keys (not sogg-free anyway), but then again - neither does a Leiber. Even guys are getting into the act. Don't date THIS fellow. If he's so possessive with his cologne, imagine how he'll be with the remote. Images: thefashpack.onsugar.com/search/Chanel?page=1 - Chanel; kissesandcrossstitches.blogspot.com/2008_11_01_archive.html - Dior; www.flickr.com/photos/mediadahling/1426655610/ - Juicy Couture Room; www.shopoholic.com.au/shop1/product_info.pp?products_id=316 - Juicy Couture Clown; igossip.com/gossip/bebe_perfume-1/824313 - bebe; www.fragrancedirec-t.com/ - Covet; theessentialist.blogspot.com - Azzaro. I laughed when I reading your post! It is true what you say! 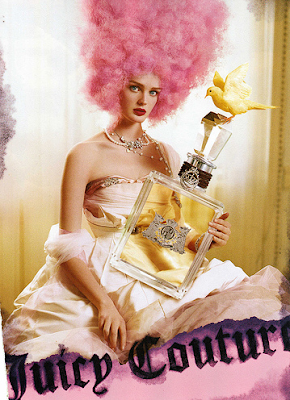 But we only see the big parfume bottles in magazines, in the parfumerie I have not seen them as big! Only a few but you can not buy them, they are more a decorative itme in the parfumerie! I would love a big bottle to put on a niche in my dressing room! You're hilarious, Skyla! And I agree that there are FAR too many perfumes out there...why does every one and their brother (or stylist) get their own scent? 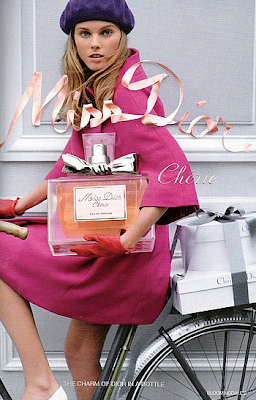 That said, I LOVE Dior's Miss Cherie. 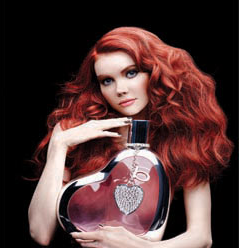 One of my favorites (along with Chanel's Mademoiselle). Very cool idea for a post, darling! Love how all these images play with scale!! what i wouldn't do to get my hands on one of those huge, sculptural bottles! thanks for yet another bit of eye candy! They would be hard to pick up to spray-LOL! You are so right! I am laughing right now, but this is so true! They certainly are pretty...as is that coat! I am looking for a coat exactly like it -- let me know if you come across anything similar? ha! i rarely notice perfume adds b/c i don't wear perfume (i know, i'm so one sided) but you make a good point!